earlier years. From the moment Felix first appeared, in Feline Follies (1919), he was a hit — even tho he hadn't yet been given his name. In that film and his second, Musical Mews, he was called "Master Tom". It was only in the third, Adventures of Felix (1919) that he received his permanent name — and his long, long career was off. According to the credits, Pat Sullivan, owner of the studio, was the guiding genius behind Felix — but in reality, the cartoons were the work of a young animator named Otto Messmer, who produced the entire four-minute debut all by himself, working at home on a freelance basis. Felix's success was a direct result of Messmer's great ability to create sight gags, and to express a character's personality through his own unique way of moving. Dozens of silent Felix cartoons were made, with increasing sophistication as the 1920s wore on. When the talkies came in, Felix was quickly eclipsed by Disney's Mickey Mouse, who had made an early and successful transition to sound. The last silent Felix cartoon was the appropriately-titled The Last Life (1928). The Sullivan Studio, which never did embrace the new technology, went into decline. When Sullivan died, in 1933, it closed its doors. 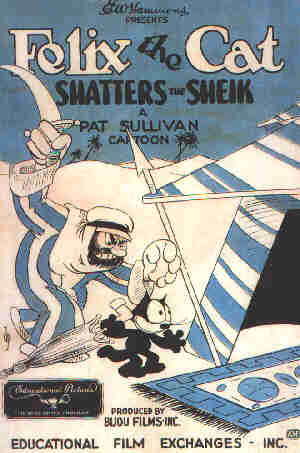 Messmer left animation to concentrate on comic strips about Felix, which he had started in 1923 (and which lasted until 1966). Felix made a brief return to animation in 1936, when the Van Beuren Studio (Tom & Jerry (no, not that Tom & Jerry)) bought rights to the character. But the charm of the Messmer years was not recaptured, and the series ended after only three cartoons. In 1960, Felix was revived once more, this time on TV, by producer Joe Oriolo. Oriolo, whose credits include Casper the Friendly Ghost and The Mighty Hercules, had worked as Messmer's assistant during the 1950s, and had taken over the Felix newspaper strip from him in 1954. It was this series that introduced Felix's now-famous "bag of tricks" — as well as the dastardly Professor, who coveted it. Voice actor Jack Mercer, whose best-known role was Popeye the Sailor, provided most of the voices in this series. Meanwhile, Messmer's comics — first in the form of a newspaper strip distributed by King Features Syndicate and later, in 1943, as a regularly-published comic book — displayed his visual imagination and solid design sense to great effect, which is why the Messmer-drawn issues are highly prized by modern collectors. The comic book, which was published first by Dell Comics, then Toby Press, and finally Harvey Comics, ended in 1961. Dell started a new series a year later, but it lasted only 12 issues. Gladstone Comics published a thick album in 1991, reprinting Messmer's comic book art; and Fantagraphics did another album in '96, this one reprinting his newspaper comics from the 1920s. From 1991-93, Harvey Comics reprinted some of Messmer's stories in comic book form, but with very poor printing. Later in the '90s, the Oriolo family put out new, non-reprinted ones, with better production values. In recent years, Felix has turned up occasionally in a new cartoon or comic strip — sometimes, unexpectedly enough, as a co-star with Betty Boop. The most recent was a Saturday morning animated series, which ran from 1995-97. Unlike his contemporaries, animation's first break-out star has a lot of life still in him. Text ©2000-06 Donald D. Markstein. Art © King Features Syndicate.